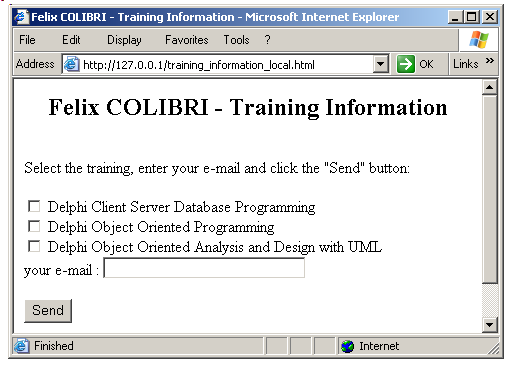 Simple CGI Web Server - Felix John COLIBRI. We will present here a simple CGI Web Server. The server will operate in graphic mode (not CONSOLE) which allows easier debugging of CGI handling. 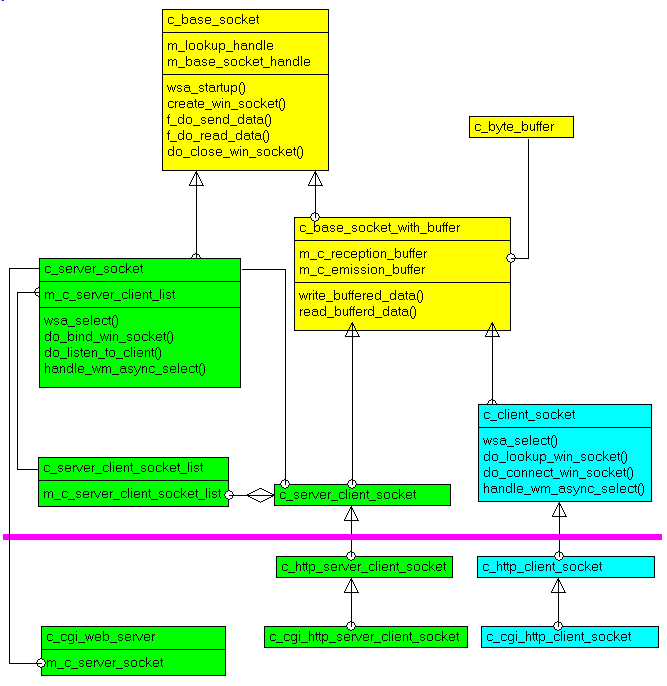 Is is based on the socket classes presented in the simple_web_server paper. The server is unaware of the details of the CGI request. It simply transfers it to the CGI executable. Each HTML Form has an associated dedicated CGI executable. So basically CGI is a way to append custom warts to an existing monolitic HTTP Web server. c <- s |ETag: "433fab0e359c51:1709"
c <- s | <FORM method="POST"
The CGI executable will receive the CGI parameters, process them and eventually send an answer back to the CGI Server. This string is sent by the Server to the Standard Input file, and the CGI executable reads them using the usual Pascal Readln procedure. The parsing of the parameter string is very simple. This answer is sent back to the Server using the standard output file, and this is done using the usual Pascal Writeln instruction. the answer is sent back to the Client. The Server extracts the executable name, and transforms this into a Windows path. The CGI parameters are extracted from the body of the request. And the answer is sent back to the Client using a standard Send socket call. As explained above, the CGI executable reads the parameters. The size of this string is in the Windows Environment block. The CGI parameter string is the parsed, extracting the value=key couples which are separated by "&" characters. An HTML answer page is then built, based on the parameters. Finally this answer is sent back to the Server using Writeln. The resulting .EXE is then placed on the Server's disk. The environment block is simply a null terminated buffer containing key=value#0 couples. We have built this block in the u_windows_environment unit. when the CGI Server is a GUI application, StdIn and StdOut (Readln and Writeln) are invalid. We must use Windows anonymous pipes. This has been explained in great detail in the StdIn_StdOut paper. receives and displays the answer. so basically, if we want to test the complete Browser cycle (send the HTML <FORM> request, send the CGI parameter to the Server, receive and display the answer) we must use a bona fide "rendering browser", like Internet Explorer or Netscape. however those browsers do not display the detail of the packets exchanged: we have to use a TCP IP Sniffer. This is the reason why we used our custom Browser, which is easier to use than a sniffer. But is this enough ? Well, this drives us into the CGI debugging domain. Our Web pages are stored on the PC of our hosting company. The Web Server itself (IIS in our case) is managed by the hosting company, and we cannot change its behaviour. CGI was the first used extension. Other (WinCGI, Isapi, NsApi, Asp) were invented later. So writing a CGI Server and a CGI Browser is not required: IIE and IIS handle those parts for you. The custom Server and Browsers are only of educational and debugging interest. the CGI Executable is a CONSOLE application, which cannot use tForm displays. this unit has a single handle_cgi procedure which is called from a VCL tForm: we can test different CGI parameters, and see how the CGI Executable handles them (loading the log, or the result page). During this test, no TCP/IP packets are involved: we hand over the CGI parameters using a global variable, and load the resulting debug files. Once we are satisfied with the u_handle_cgi performance, we build a CONSOLE application which calls this same unit and compile it. The CGI Server is started, and can display the packets exchanged with the CGI Browser. we upload our <FORM> .HTML page and the CGI Executable at our hosting server. And this cgi log is used during the lifetime of our CGI executable to analyze any unexpected exception. All intermediate steps before uploading the .HTML <FORM> and the CGI Executable are only partial validation steps. Only the use of the real server (IIS) and browsers (IIE, Netscape) will tell whether our Server extensions are without major bugs. When Delphi was introduced, CGI was the main Server extension mechanism. Many commercial tools and helpers were offered to ease the creation of CGI executables (like hRef ) with presentations of those tools by Ann LYNWORTH, or CGI Servers to allow local testing. However the CGI mechanism has been often criticized, mainly because a new .EXE must be loaded to handle each Client. A better way would be to dynamically load a .DLL which could stay in memory and shared among several Clients, and which could be eventually unloaded. This is the IsAPI (NsAPI) route. ASP is yet another possibility for Server side dynamic page generation. In addition, not many hosting companies allow you to write your own CGI. CGI are .EXE placed on the server. They can perform there whatever the server allows them to do: erase files, allocate memory without freeing it, get stuck in infinite loops etc. So hosting companies prefer scripting server add-ons, like PHP, which are easier to control, especially on shaking OSes like Windows. Since our hosting service allows CGI Executable, we continue to use them on this site because we find them easier to write than the other Server extension types. will not modify your PC in any way beyond the path where you placed the .ZIP (no registry changes, no path creation etc). RIT Labs offer the Tiny Web Server, which is a full open source code CGI production quality Web Server. The full .EXE is 76 K byte long, despite full threading capabilities. Analyzing the sources, we see that they rewrote everything from scratch (collections as a container class replacing tLists or tStringLists), all necessary SysUtils routines (string utilities, integer conversions etc), and tailored built threading classes. This avoids the huge weight of some libraries (SysUtils, FileCtrl etc), and maybe also the thread safety issues of the early VCL libraries. In any case this beauty compiles in 76 K. The only drawback is the CONSOLE mode, which forbids any GUI extension. You still have ASCII logs, and some people have written GUI extension of the product.